The aim of this study was to evaluate the prevalence and influence of malnutrition (unintentional weight loss ≥5% in the last 3 months) on quality of life (QoL) and performance status (PS) in head and neck cancer patients (HNC) before treatment. Sixty-one consecutive outpatients affected by locally advanced HNC (III–IVA stage) were enrolled. 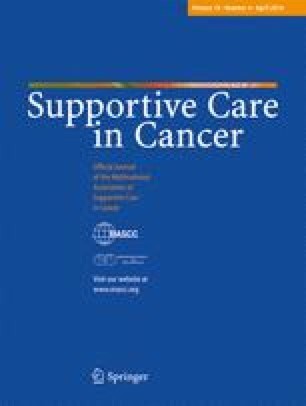 In all patients, nutritional intake (by diet history), nutritional status (Patient Generated Subjective Global Assessment), unintentional weight loss (UWL), serum prealbumin, hemoglobin level (Hb), C-reactive protein, QoL (European Organization for Research and Treatment of Cancer Quality of Life Questionnaire C-30 v. 3.0), and PS (Eastern Cooperative Oncology Group (ECOG) PS) were assessed before radio or concomitant chemoradiotherapy. Thirty-six percent of HNC were malnourished before treatment. The median ECOG PS in malnourished patients was 1 (0–2), whereas in nonmalnourished was 0 (0–2; p = 0.018). Physical (p = 0.043), role (p = 0.047), and social functions (p = 0.024) scores were significantly worse in malnourished than in nonmalnourished HNC. Fatigue (p < 0.001), appetite loss (p < 0.001), and nausea and vomiting (p = 0.002) scores were worse in malnourished patients than in nonmalnourished. In the multivariate analysis, UWL and Hb level independently influenced physical (p = 0.002; p = 0.005), role (p = 0.004; p = 0.001), and social functions (p = 0.024; p = 0.009). Our data suggest that an early and intensive nutritional support might reduce weight loss before, during, and after treatment completion, improving outcome, QoL, and PS. We are grateful to the oncologists and nursing of the Oncological Department of San Peter Hospital in Rome. There were no grants or funding for this work. There was no conflict of interest.